"Open Arms Rescue" held its Ribbon Cutting Ceremony at Surf Dog Competition! Imperial Beach Chamber of Commerce & "Open Arms Rescue" held its Ribbon Cutting Ceremony at Surf Dog Competition! Open Arm Rescue located in Imperial Beach Specializes in Saving Small Dogs! Baja, monitor them, vaccinate them and then transport them to the US straight into volunteers homes for fostering until they can be adopted out. 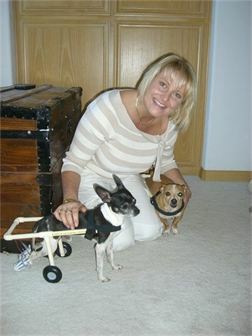 We also take in injured dogs that require surgeries to become healthy and adoptable. Typically when a California shelter receives an injured or special needs dog that is in need of surgery that the shelter is unable to perform due to their limited funds/resources they will either put the dog to sleep or only exit it to an approved rescue partner who can get the necessary medical care performed. We take a lot of these cases in and our adoption fees help support the medical bills. 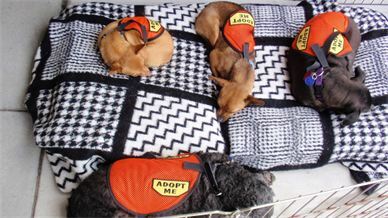 All of our dogs for adoption are spayed or neutered, microchipped, fully vaccinated, flea/tick treated and de-wormed. We are always in need of volunteers to foster a small breed dog. If you would like more info on becoming a volunteer foster parent please see the last page on this site "volunteering to foster" and if you would like to be contacted send us your info on "contact us" page.